Clever and quiet tower design makes the most of tight spaces. 75 oscillation circulates cool air throughout the whole room. Features three-speed settings, oscillation on/off control, wind modes, and eight-hour automatic shut-off timer. Multi-function remote control and LED display for added convenience. 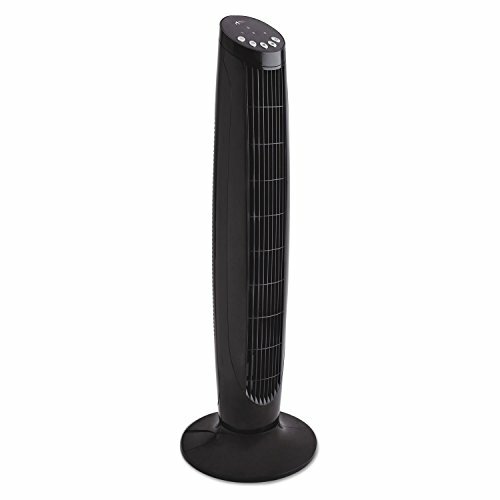 Fan Head Size: 36"; Fan Type: Tower; Color(s): Black; Tilt (Degrees): 75. Oscillates 75 to circulates cool air throughout the whole room. Features three-speed settings, oscillation on/off control, wind modes and eight-hour automatic shut-off timer. Multi-function remote control and LED display for added convenience.